St George on horseback rears over the dragon. Sitting proud in the saddle and wearing a flowing cloak and a riding hat with ostrich plumes, he confidently spears the dragon in the mouth with his lance held in his raised right hand. With his other hand he holds the horse’s bridle. In the distance the rather passive maiden waits before a church spire surrounded by trees. The landscape is depicted in shallow perspective, and shading of the vegetation and the horse is achieved by stippling. A platform at the base is supported by columns, the central of which is inscribed S. George. The sky is unpainted. 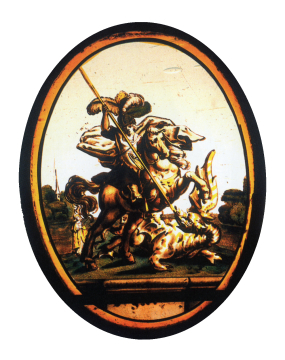 St George rescuing the maiden from the dragon was a common subject in German, Swiss and English roundels. Originally a representation of the triumph of Christianity over paganism, it was later elaborated in the Golden Legend to include the rescue of a king’s daughter. The combination of the lettering, the low perspective, the brio of the cloak’s execution and the yellow stain border suggest a German origin.